Wiltshire’s high rolling chalk downs and exquisite valleys create a diversity and beauty of landscape which gives rise to its reputation as the county of chalk and cheese. 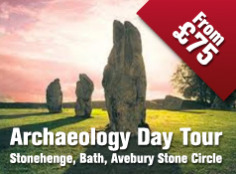 It is the ‘Gateway to the West Country’ and enigmatic home of Stonehenge, Avebury, White Horses and Crop Circles. Tales of these places, their history, myths and legends are brought alive and will move the visitor to return again and again to find out more. Walking tours vary from a relaxed stroll around the regions major centres to a more invigorating full day exploration in the wonderful Wiltshire countryside. Alternatively we can join your coach at a place of your choice for a full or half day tour where our local knowledge will enable your Group to enjoy the variety and beauty of this part of England. Whether you are staying in Salisbury and the surrounding area for just a day, or here for a longer visit, a guided tour will bring the city alive, as well as enhancing your visit to other places of interest. Salisbury City Guides are professional Blue Badge tourist guides who offer a wide range of walks, talks and tours throughout the year, tailored to suit your requirements. We cover many languages and are always pleased to assist with your plans. Our various themes include the medieval city; ghosts; the Cathedral and The Close; Old Sarum and Stonehenge; exploring Wilton or other local towns and villages; art and literature; local gardens and churches. Walking Tour of Salisbury April - October daily, November - March weekends. Tour starts 11am. Adult £4, child £2 Ghost Walks around Salisbury May - September every Friday. Tour starts 8pm. Adult £4.00, child £2.00. Both Walking Tours and Ghost Walks start at the Tourist Information Centre, Fish Row, Salisbury. Special events include Spooky Weekend Halloween ghost Walks - please contact Salisbury Tourist Information Centre for more details. All our regular city and ghost walks are open to everyone, as are most of our special event walks. We welcome enquiries from groups with particular requirements, as several of our guides have experience of working with various disabilities. Most of our walks start and end in the city centre, which is well served by public transport, including Park and Ride. Privately booked walks or tours start and end at a time and place most convenient to the client(s). 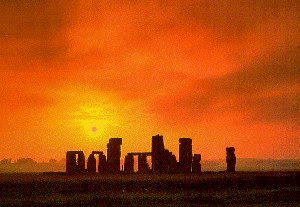 I’m lucky: the real Stonehenge is only about 10 minutes’ drive from my front door, so I can go and visit whenever I like. 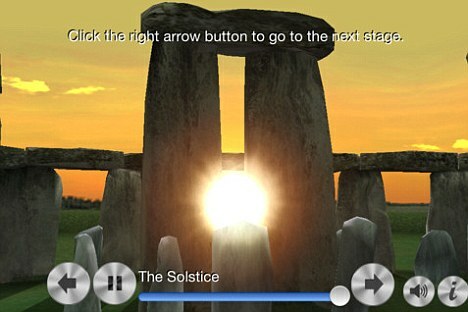 For students of prehistoric monuments who live further afield, the Stonehenge Experience app for iPad offers a tiny glimpse of what this ancient English stone circle is all about. It’s not an “official” Stonehenge app, in the sense that it’s not produced by English Heritage, the body that looks after Stonehenge. But it has been put together with proper care, and gives you a decent overview of the history of the site. Most of this is done with computer generated 3D scenes, which you can manipulate to a certain extent. 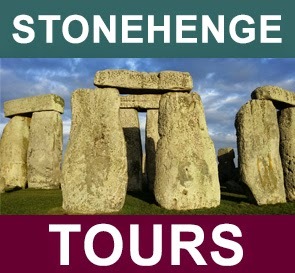 These let you zoom in and out of Stonehenge-as-was, and view it from any angle. Short voice commentaries provide some historical context. Stonehenge is just one monument at the centre of a much larger network of sites spread over many miles, and it was good to see that this app doesn’t ignore them. It includes information about Durrington Walls, Woodhenge and the Amesbury Archer, among others. There isn’t a huge amount of detail, and you can get through all the content here pretty quickly. There are some small errors that are a bit jarring (just mis-spellings, mostly), and some of the animation is a bit juddery, but other than that there’s little to find fault with. Whether you’re a keen student of ancient history, or just planning to visit Stonehenge next time you’re in the UK, this three-dollar app is a good introduction to the basics, and might provide you with some useful starting points for further reading. A temple found on Orkney off the northern coast of Scotland may predate Stonehenge by 500 years. While only 10% of the site has been excavated archaeologists believe that the new discovery pre-dates Stonehenge and will redefine what is known about the Neolithic period in Britain. An outer wall is all that's been revealed so far but modern instruments have allowed archaeologists to estimate that the wall itself was probably once 10 feet high while the complex as a whole might have been the equivalent of five football pitches in size.